How are you going to prepare your business for the holiday rush? * Adding more merchandise to the shop. I'm currently up to 83 items for sale. And I'll like to make (and then add) a few more each week as we get closer to Christmas/Hanukkah/Solstice. 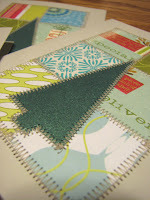 * I added another colorway for one of my favorite items -- the "Gather 'Round The Aluminum Tree" Christmas/winter cards. I love this combination of aqua and lime/chartreuse. * I'll be participating in a big sale through the EtsyBloggers team. So if you've been thinking about making a purchase, you might want to wait a week or so. The sale will run from Black Friday (the day after Thanksgiving) through Cyber Monday (December 1). Stay tuned for more details! Good luck with your sales! Also wishing you the best with your sales. Many of us can use some business.